1.5 mile race tracks have become stale to NASCAR fans. However, those races could see drastic and wide spread changes next season. Aero Ducts: These are designed to feed air to the trailing car. Far too often, a car can run down the car ahead only to stall out in the the dirty air behind him. This makes it hard to pass. The aero ducts feed air from the nose of the car out of the wheel wheels. That air then lands on the nose of the car behind. It limits the amount of downforce lost when a car pulls to the rear bumper of a competitor. Restrictor plate: This is actually another way of fixing the same aero issue NASCAR has fought for years. The cars are going significantly faster than they were in the 90’s. The pole speed in the 1990 Coca-Cola 600 was 173.963. The pole speed for the 2018 Coca-Cola 600 was 191.836 mph. Alternatively, Kyle Larson ran a 173.305 on final practice for the NASCAR All-Star race with this proposed package. Essentially, the restrictor plate takes these cars back to the speeds of the 1990’s. Why would they want to do that? The fastest the cars go the more aerodynamics come into play. By reducing the speeds, it allows cars to pass without losing the front end behind the bumper of another car. Rear spoiler: It does the same thing as both items above. The negative side effect is that while the cars are less aero sensitive they are also further under control of the racing driver. There’s less skating around the track. So far, the package has only been tested once via the Charlotte All-Star Race. 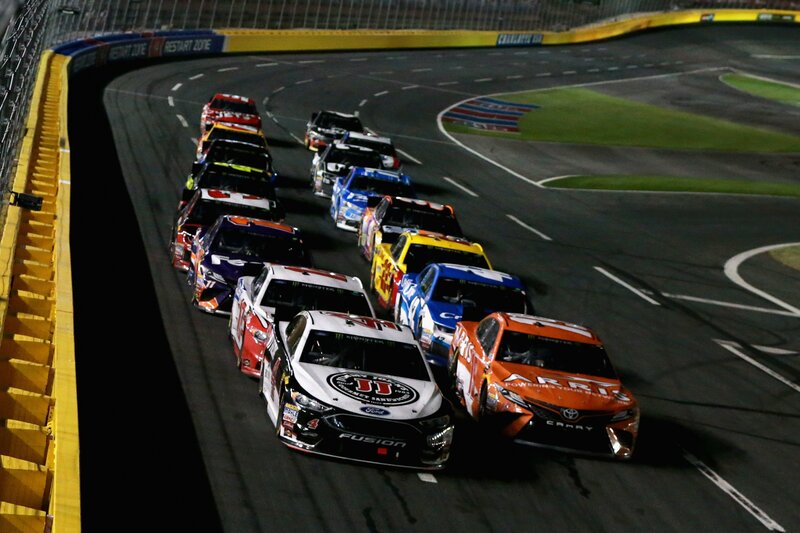 It created an All-Star Race with the most lead changes in the history of the event. It wasn’t pack racing but it certainly kept the field closer together. Fans were mostly in approval of the event. The drivers had mixed reviews. NASCAR was working to run it at Michigan Indianapolis, Chicagoland and/or Pocono in 2018. NASCAR conducted a test with the package at Michigan International Speedway in June. However, they scrapped that idea for a second run in an official race. Now, that same package is being proposed for 2019 on a much larger scale. Following several industry meetings the 2019 rules package on the table once more. Paperwork has surfaced from a July 11th meeting with the NASCAR Rules Committee highlighting the proposed changes. That paperwork says the new rules package has been proposed for 13 races in 2019. Essentially, every 1.5-mile and larger cookie cutter track. “Work for 2019 has definitely begun,” Scott Miller stated via Sirius XM NASCAR Radio. “We’re working closely with the industry trying to come up with the 2019 rules package and whether or not that incorporates something similar to what we saw at the Charlotte All-Star event or an iteration of that,” Miller concluded. “Discussions with the industry concerning the 2019 rules package continue as planned. We look forward to sharing information once the rules have been finalized,” Miller told Racin Boys when asked about the leaked documents.